Mental health issues impact a staggering amount of people worldwide and is yet simultaneously one of the most misunderstood topics. The stigma surrounding mental health and the effect it has on us all is enough to fill countless episodes. However, today’s episode is a brief- yet crucial- entry point on how to deal with mental health issues with a guest who knows first hand what it’s like, Wendy Foster. Living with borderline personality disorder, Wendy’s story is truly inspiring. Instead of allowing her mental health to get the best of her, Wendy made a change when she decided she would spend her life advocating on behalf of women’s mental health. Her diagnoses is not uncommon but her tenacity is what truly separates her from the crowd. Too many people not only live with mental illness but refuse to get help due to misunderstandings or fear of what other’s may think or say. There needs to be a shift in how we think and speak about mental health in order to properly address and help those affected. By going out and speaking about this as someone living with her own mental health issues, Wendy is not only becoming the face of change but the voice for a silent majority. I highly recommend listening to this episode and checking out more from Wendy because this problem impacts so many of us, whether it be personally or through our loved ones. The differences between how we treated mental health patients in the past and now, and the long ways we still have to go. 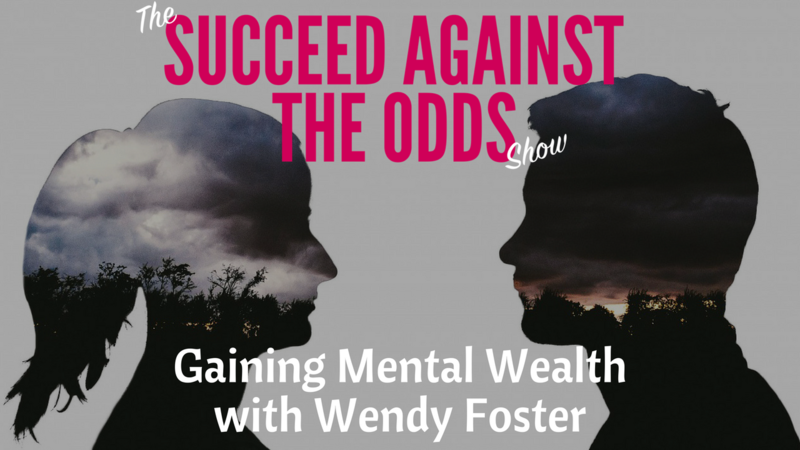 Overcome the obstacles and gain mental wealth through your mental health in episode 5 of the Succeed Against the Odds Podcast.